When you see Jessica Arevalo, 31, a social media fitness star (@jessicaarevalo_) and bikini competitor, in the weight room, you might not expect her gym buddy to be Garrett Greer (@GarrettJGreer). 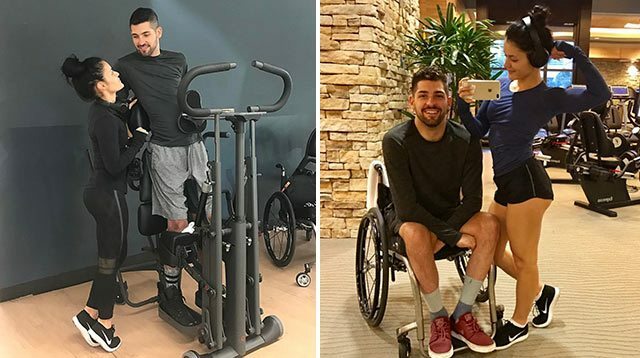 But the 31-year-old professional poker player, who was paralyzed in 2010 after he broke his neck, isn't just a stellar workout partner—he and Jessica have been dating since they met at a lounge in California last fall. The couple, who recently moved into Garrett's Santa Monica home, have made a name for themselves in the online fitness community for posting videos of their partner workouts. Although Garrett can't move his lower body and has limited functioning in his upper body, strengthening the body parts he can control has made him feel healthier and better about his condition. "It feels good to be doing something active," he says. After spending several months in Las Vegas, where Garrett played poker, he's now getting back into the five-days-a-week training regimen he practiced before the trip, thanks to Jessica's inspiration. Jessica, who picked up bodybuilding in her late 20s and has competed in 33 bikini competitions, has built a career as a fitfluencer on Instagram, where she's amassed more than 2.6 million followers, and on YouTube, where she has more than 183,000 followers. Jessica encouraged Garrett post his workouts on Instagram in the first place. The couple's most popular video, which shows Jessica spotting Garrett lifting weights as she straddles him, went viral in December on both of their accounts. "It's cool when she comes over and spots me during sets, or corrects my form," he says of his sometimes coach, who helps Garrett discover new exercises to try. And it's tricky: While each case of paralysis is unique, Garrett can still move his biceps, not triceps; the tops of his forearms, but not the bottom of them; and his chest and upper back, but not his core. He has no dexterity in his hands, although he can move his wrists in a way that tightens his fingers to create a faux grip. Due to this limited hand functioning, Garrett uses special gloves to grip free weights, medicine balls with straps, and wrist cuffs with hooks to hang onto cable machines. "I work on what I can do and test my limits," he says. After all, although there's no guarantee Garrett will ever regain full control or feeling throughout his body, he has been told that exercise may encourage nerve regeneration. "You really can't know what functionality you've gotten back without trying to move it," he says. While Garrett is hopeful he'll walk again one day, he has Jessica's love and support, regardless of what their future brings. "I think he is absolutely perfect just the way he is," Jessica wrote in an Instagram post. "I told him if he were to be able to walk again some day, that it would be too much perfection to handle."